Set in Alaska in 2040, Melissa Marn and Bruce Wilder must work under the iron fist of the SCM, while still trying to maintain humanity. Discovering a world of shifters and hybrids, the scientists must struggle with human prejudice and betrayal. 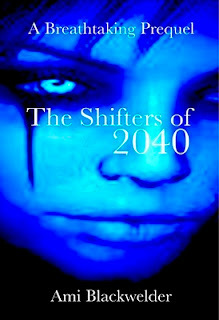 With the original ancestors, dubbed shifters, still living on earth, humans are in the midst of a fifteen year old war. As the eldest hybrids, Unseen and Diamond, learn about humans the hard way, with the loss of loved ones and sacrifices, love on planet earth proves challenging. Wow!! An other other awesome book!! I started reading it this last night. If it weren't that I was so sick I would have stayed up late reading this book. I picked it up again this morning and I just couldn't stop reading this book.Now I want to read all the other books in this series. I highly suggest this book if you are in paranormal romance novel. I must warn you, you will not want to put this book down and will want to read more. Check out Ami Blackwelder's site if you want to know more or if you want to buy her book .